Strawberry Mimosas make brunch rosy! Whether you make them for a weekend with gal pals, a wedding shower or a celebration like Easter, Mother’s Day or Valentine’s Day, these sparkling pink mimosas are the perfect way to toast the day ahead. In a blender, puree strawberries until smooth. 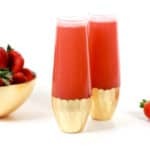 Spoon 1-2 tablespoons of the strawberry puree into the bottom of a champagne glass.